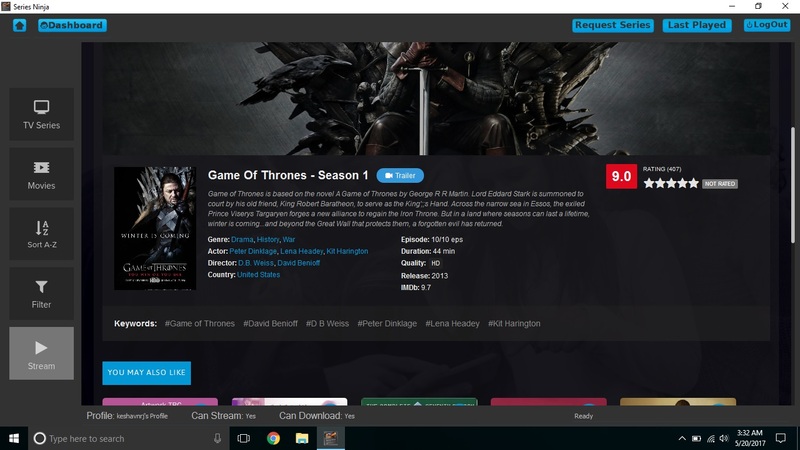 Series Ninja allows you to watch and download your favourite TV series on Ubuntu/Linux & Windows Desktop. Series Ninja TV Series App showing Series information in the sidebar. Browse, Search, Stream and Download your favourite Tv Series / Movies /Documentary /Animation etc easily. App include inbuilt two players to stream videos easily, the default Player is fully configurable and support switching video/audio output drivers , Player also support reading embeded subtitles from video being streamed with option to hide them too. You can load unload your custom subtitle file with one click. You can change audio speed and toggle full screen window obviously. With the second player you get all the functionalities you gets with famous MPV player for Linux. The Player is written in Qt and uses libmpv1 to bring all features from the core MPV player. You can checkout the keyboard and Mouse shortcuts with one click from within the player. Users can Download the Series Episodes with one Click . All Downloads supports resume functionality to start paused downloads later. Currently users with Platinum plans can only download items from application. Below Screenshot shows the download widget included in application. Series Ninja Snap Package is available in Ubuntu Softwares App , Just search the name and click install button to Install it on Ubuntu/Linux. You can also download the latest package from UApp Explorer and install it.